This store is like a Pandora’s Box, waiting to be discovered and is full of vintage-esque home decor beauties to add some delight to your gorgeous homes. 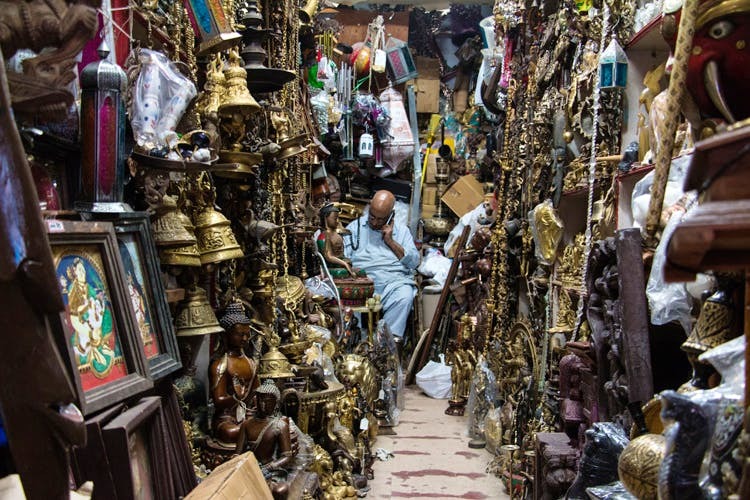 In the supremely crammed lane that Commercial Street is, lies an even more crammed store full of treasures that look like a store straight out of Diagon Alley in Harry Potter. A part of the store lies in the staircase leading to the store itself, with things tumbling out of place, managing to just about stand on their own feet. These “things” that we’re talking about and you’re probably wondering and waiting to find out, is a hoard of antique-looking darlings that you can adorn your home with for an out-of-history-books kind of feel. More so inside the store! Old railway lanterns, metal lunchboxes that your great grandfathers would’ve probably used, Victorian clocks usually found in railway stations in London, gramophones that will add instant artistry to your living room are things we couldn’t resist. For the spy in you, or for the James Bond instincts that are too prominent in your father, boyfriend, girlfriend or sister, this store is your best bet for birthday/general presents. Magnifying glasses that look like they were touched by Sherlock Homes, binoculars straight out of Johnny Depp’s paraphernalia in Pirates of the Caribbean, vintage telescopes that you can use to stargaze, old-school cameras with leather bags that are a rarity, and even a whole gorgeous collection of ancient ship clocks with bulging convex glass had us at first sight. It would be fair to say that we can’t vouch for the authenticity of the products, how ancient they are, whether they’re actual antique pieces or refurbished for that vintage look, is doubtful. The store owner claims that they are all refurbished, but we think there might be a few real deals out there — you never know, you’ve just got to go there and find out for yourself. But if you don’t care much about the authenticity, shut your eyes and walk in. No, actually walk in with your eyes wide open. Don’t forget to bargain hard on anything you might set your heart on. The owner is known to relent and offer you a nominal one.